Chick pea is best pea. And more than that. For a longtime chickpeas occupy an important place on my plate. Indisputable my favorite variant form of it is Hummus. Incomparable. Unbeatable. Unsurpassable. This recipe from Humus101 is a good starting point, although I usually quardruple the amount. But by far Hummus is not everything you can make from chickpeas. I love it as an ingredient of pasta sauces (i.e. in tomato sauce or with mushrooms), as a salat (just with some garlic, olive oil, lemon juice, herbs, salt and pepper), in soups or straight from the jar or bin. Also, roasted chickpeas are a great snack for on the run or on the couch. 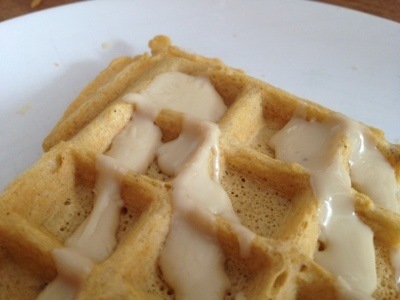 Today I tried something new (for me) and used some gram flour (flour made of dried chick peas) to make a waffle dough. in a large bowl and scooped it in the well preheated and greased waffle iron. It turned out pretty yummi. Nutty aroma, rich but not to heavy. A little dry. But soaked in white almond cream just perfect. I guess I’ll try more fat or maybe some blueberries in the dough next time. Darf ich auch auf deutsch antworten? Ich habe noch ein schönes Kichererbsenrezept, insbesondere wenn man vegan essen möchte, nämlich veganes Kichererbsen-Rühr”ei”. Das ganze musst Du gut verrühren, so dass es keine Klumpen mehr hat und lässt es dann in der Pfanne stocken. Wenn es gestockt ist, kannst Du es wie Rührei etwas zerpflücken und lässt die Stückchen noch bräunen, dabei – eben ähnlich wie Rührei – immer wieder rühren. Ich mache das auch immer noch mit Zwiebeln, manchmal mit Knoblauch oder Kräutern… J. liebt es! Klar. Darfst in jeder Sprache antworten. Deutsch und englisch krieg’ ich ohne Wörterbuch hin. Hört sich auch spannend an. Danke! Werd ich mal auf die ausprobieren-Liste packen.